The perfect compliment to your dream kitchen is a custom pantry. A well designed pantry will add a tremendous amount of functionality to any kitchen. 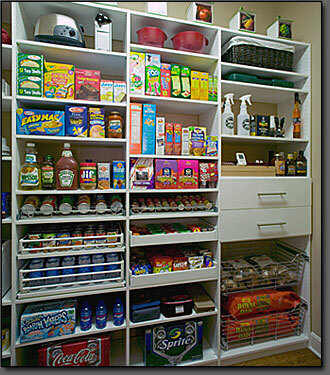 The key to an organized pantry is adjustable shelving. The items we store in a pantry often change and vary in size. Adjustable shelving can accommodate any item you purchase over the years. Further enhance the basic adjustable shelving by adding drawers, baskets, pull-out surrounds, and interior pull-out shelving. 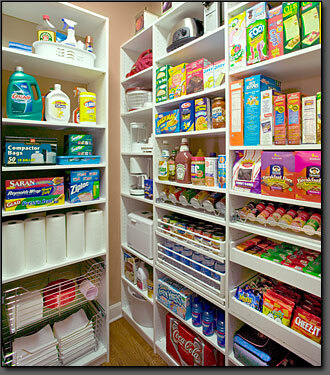 Check out the variety of pantry accessories and options we offer. ©2009 ORGANIZED STORAGE SYSTEMS, INC.